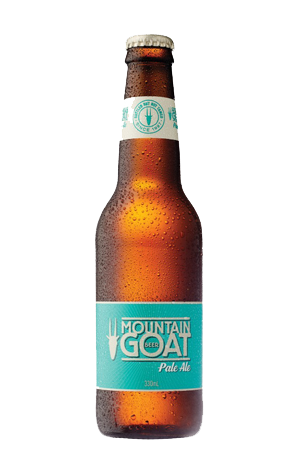 A few years back, Mountain Goat had a Pale Ale that formed part of a range that also featured the Organic India Pale Ale, Hightail and Surefoot. Now, after the original pale was abandoned when they streamlined to Steam Ale and Hightail, a new Pale has arisen. It's a much different beast from the original and is based upon the delicious North St Pale Ale that's been pouring over the brewery bar for the past year or so: a fruity as you like, well balanced and extremely drinkable American-inspired pale. The new Pale that is going out nationwide isn't quite the same, however. It's trimmed a little to 5.2 from 5.7 percent ABV and, when bottles arrive in October, they'll come courtesy of their packaging partners at Asahi, who have been helping them sate the masses' desire for Steam Ale as well as packaged Hightail, Summer, Fancy Pants and Surefoot. Kegs are available now with bottles planned as a two batch release for summer. With the IPA discontinued, the Pale slots in as the biggest and hoppily fruitiest (think pine and stone fruit thanks to the use of Chinook, Mosaic, Cascade, Citra and Centennial hops) of the trio of hoppily fruity pale ales Goat will have out and about for summer.